Pharrell Williams has been one of adidas Originals‘ biggest assets. Even in the days before Kanye West’s signing, Skateboard P was holding down the collaborative front with the three stripes to usher in a number of awesome looks for the German lifestyle brand. Today we get a look at the upcoming Pharrell Williams x adidas Originals “Pink Beach” Collection which takes inspiration from island culture’s vibrant energy. 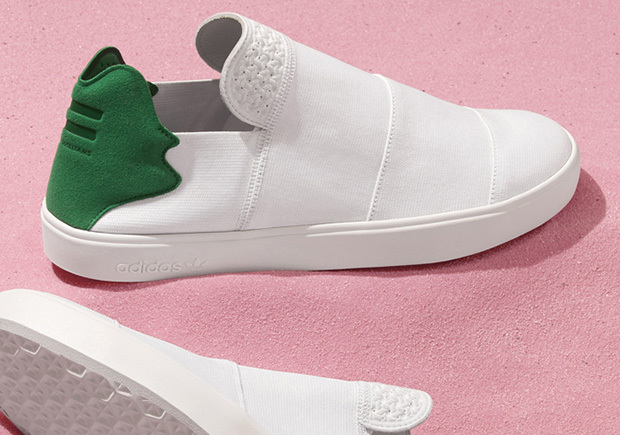 Pharrell offers up the new adidas Elastic Slip On and the adidas Elastic Lace Up, an elastic Qasa-esque take on the adidas Stan Smith. That classic white and green tennis look is available in both constructions while a more colorful pattern that is directly inspired by tribal art. This collaboration will launch May 5th. More detailed photos below.